Benny Coulter starred for Down as they overcame Carlow 1-19 to 1-13 in their Bank of Ireland SFC qualifier in Dr Cullen Park today – the Mourne men's first ever 'back door' win. 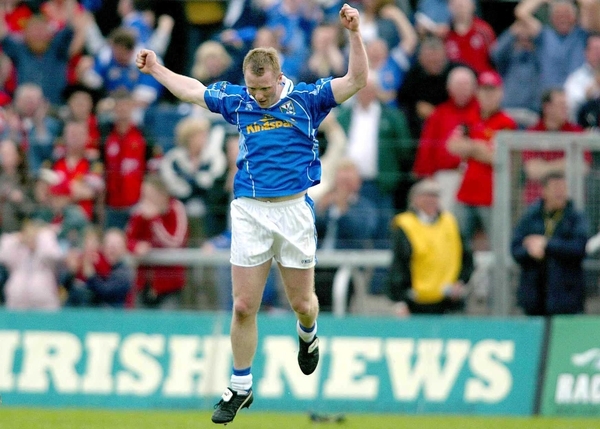 Although tireless Éire Ó forward Simon Rea commanded much of the crowd’s attention with his tally of seven oints, Coulter drove Down back level at 0-05 apiece, and netted the vital goal. A word too for goalkeeper Mickey McVeigh whose two saves in either half from Mark Carpenter and Brian Kelly came at crucial times in the game with Down holding only slender leads on both occasions. Carlow raced into a 0-5 to 0-1 lead thanks to scores from Carpenter, Kelly, Rea (0-2, 1 free) and Johnny Nevin - Coulter notching Down’s opening score from a free. But Down's Gregory McCartan and Dan Gordon gradually began to dominate midfield and the Ulster side reeled off points from Aidan O’Prey (0-2), Coulter and nifty corner forward Dan Hughes to square it up by the eighteenth minute. Coulter then struck with a smash-and-grab goal, slotting coolly past James Clarke after a good interchange between Hughes and Dan Gordon. Nevin produced a quick response, and with Carbery scoring one for the direct route purists and cancelling out a Shane Ward effort, Carlow were back to within two points of Down on 24 minutes. Seconds later McVeigh pulled off a fingertip save from Carpenter and, enthused by this, Rea hit the closing two points of the half – the first a rangy ’45 and the second from an acute angle on the right wing leaving Carlow just 0-10 to 1-08 in arrears at the interval. Ward, McCartan and half-back John Clarke pushed that lead to three points, with Carbery responding, by the 45th minute. Substitute Ronan Murtagh then scored a quick brace to make it a six-point game, 1-14 to 0-11. Carbery’s point 51st minute point attempt hit the upright to find Kelly in space but McVeigh saved superbly. Rea left-footed a free over to close the gap two minutes later. 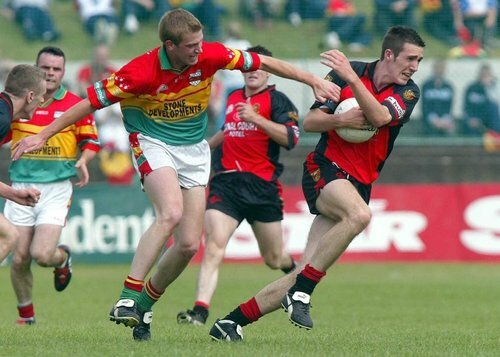 After O’Prey and Ronan Sexton had pointed, Carlow substitute Tomas Walsh played in the pass that saw Carpenter finally beat McVeigh with seven minutes remaining. But four points was as tight as it got with Coulter, Ward and O’Prey stretching Down's winning margin to six.